Length N/A 44.5" 44.5" 45" 45"
This fully-lined women’s midi-length evening dress is one that will help you leave an unforgettable impression. It was designed to flatter the female form in the most graceful, elegant way possible. This dress has an expertly fitted bodice. The waistline is defined by a wide panel that is curved under the bust line. The neckline is rounded and features a swath of satin with a decorative cloth rose embellishment. This dress comes in three color choices. Select your favorite from blue, black or red. The full skirt hits the mid calf area of the leg. 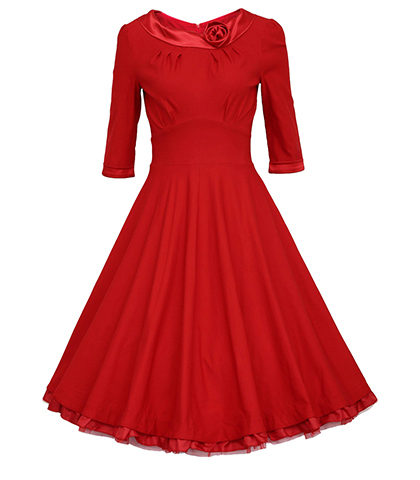 The dress is available in sizes Small, Medium, Large and Extra Large.